We believe the integration of curriculum, character, and community provides the foundation for developing the whole child. Our program emphasizes a balance between academic and social-emotional learning–we consider these aspects of development equally important within the elementary education experience. Social-emotional learning at Meridian is integrated throughout each day and informs our school-wide expectations and the language that we use when interacting with one another. Two curricular approaches–Responsive Classroom and Social Thinking–guide our teaching and learning. 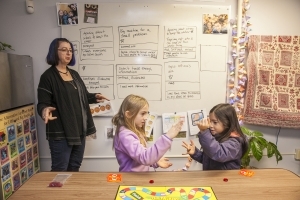 Our full-time, Social-Emotional Learning Specialist supports large group instruction led by classroom faculty, and facilitates small group counseling for students and families. Individualized or small group support is emergent based on student needs. This year’s groups included; adoption, anxiety, executive functioning, family changes (separation, divorce, loss of a parent), friendship circles, social skill-building and welcome wagon (for new-to-Meridian students). The Responsive Classroom approach is a nationally used, research- and evidence-based way of teaching that improves students’ social and academic skills and raises teachers’ instructional quality. Our faculty members are trained in the Responsive Classroom approach, and use it to inform teaching practices and community expectations. To be successful academically and socially, children need a set of social skills: cooperation, assertiveness, responsibility, empathy, and self-control. Developed by Michelle Garcia Winner, a speech language pathologist, social thinking is the process by which we interpret the thoughts, beliefs, intentions, emotions, knowledge and actions of another person along with the context of the situation to understand that person’s experience. 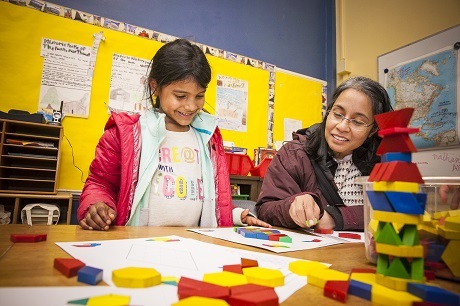 Our faculty members are trained in the Social Thinking approach, and utilize The Incredible Flexible You curriculum to describe and demonstrate concrete concepts through structured learning and play. Our students learn about social minds and expectations, become flexible problem solvers, and consider how their actions and behaviors are perceived by others. Check out Social Thinking Vocabulary for the Early Learner to learn more! Social thinking is our meaning maker. We observe and listen to interpret the perspectives of others. The first step to improving social thinking is to keenly observe the social world that surrounds us. When seeking to engage or simply share space with others, we use social thinking to adapt our social behaviors (social skills) effectively as a means to meet our social goals. To do this, we must learn strong self-awareness, self-monitoring, and self-control. We must learn how to adapt our physical posture depending on the context, how we use our eyes to better understand others and communicate, and tools for conversational language to relate to others. Our social thinking and social skills directly impact how others feel about us. This impacts how we are treated, how we feel about others, and ultimately – how we feel about ourselves! At the end of the day, our social experience is an emotional experience. The purpose of social thinking is to produce social behavior that gives others the emotional experience you intend to give. The Social Thinking Methodology teaches people to be more aware of their emotions and better predict and relate to the emotions of others. We are constantly thinking about what we want our fifth graders to know and be able to do when they move on to become members of a new learning community. Ultimately, our goal is to graduate global citizens who are empowered to inquire, investigate, innovate and impact their communities. With this goal in mind, we established our Meridian Learner Attributes; competencies which inform how we measure the academic and social emotional growth of our learners. Collaborator: we work with others in a variety of situations. We are responsible members of teams and can adopt to a variety of group roles. We understand and reflect on how our behavior affects the group. Communicator: we express ideas and information with confidence. We listen with our whole bodies and use a variety of forms of communication (verbal, written, non-verbal). Compassionate: we demonstrate Meridian Cares: We care for ourselves. We care for others. We care for our place. We are mindful of our environment, and care for and respect others while showing empathy and kindness within our communities. Critical Thinker: we approach situations and problems with reason and logic. We apply critical thinking skills (analyzing, evaluating, interpreting, and synthesizing information) in a variety of situations. We can form arguments, solve problems, and reach conclusions. We consider other perspectives and develop creative solutions to problems. Flexible: we utilize strategies to adapt to unexpected changes in a variety of situations with a positive attitude. Love of Learning: we seek out new topics and information, and show genuine curiosity in and out of the classroom. We share our learning, and participate and engage in a variety of activities. Open-Minded: we engage in activities and conversations that challenge us to grow. We are open to others’ thoughts and perspectives. We are willing to go outside of our comfort zone and are open to different challenges. Perseverance: we persevere through a variety of tasks, work to the best of our abilities, and are reflective. We demonstrate determination and commitment to our learning. Problem-Solver: we come up with a variety of solutions and willingly consider different ideas. We approach problems with creativity. We test different theories and consider different outcomes. Researcher: we formulate questions and collect information in a variety of ways about a multitude of topics, problems, interests, and issues. We analyze information and sources carefully and critically. We acknowledge the source of the information. Self-Manager: we know ourselves as learners. We advocate for what we need to to learn and can learn independently. We recognize our inward and outward needs and can access tools to independently reset. At Meridian, students are guided toward self-discipline and thoughtful decisions, mindful of themselves, others and their environment. As an entire learning community, we agree to practice Meridian Cares, which serves as the foundation for our school-wide expectations. I care for myself: we recognize our inward and outward needs and feelings, can share and express these to others, and can seek support in order to regulate and grow emotionally. I care for others: we care for and respect others while showing empathy and kindness within our communities. I care for our place: we are good stewards of our public, community building which is home to more than two dozen organizations. This collaborative environment offers enriching interactions for students and faculty, and models the many ways in which we can learn from those around us. 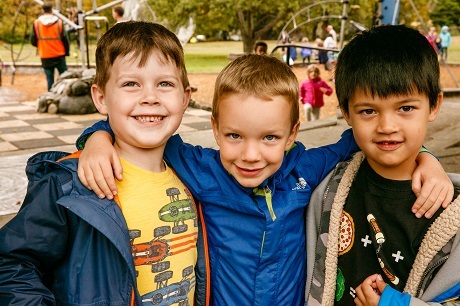 The Meridian School promotes diversity of thought and identity by bringing together community and curriculum to open minds and hearts, connect awareness to actions, and celebrate the contribution of the individual to the community.